"Well, I'd never have a sail on my boat, but that's fodder for another thread. " I wasn't really considering sails until I came across this boat. I can understand why people wouldn't want a full-on sail boat. (accommodation in a cave; exposed to elements; narrow beam with poorly laid out living area; sails always require adjusting; decks not designed for relaxing; boat heeling at uncomfortable angle' etc. A true motor sailer is a different animal. It is a much different design from a normal rag boat. I can choose when and where to use the sails, but so far I find them useful 75% of the time; half of that being while the engines are running. I can't sail into the wind as tightly as a "real" sail boat but that requirement is rarely encountered. The biggest benefit is how they provide a much more comfortable motion in rough water. I would guess my sails would reduce rolling as much as any stabilizers would, with the added advantage of increased speed and economy. It takes less than 10 minutes on my own to set and trim the sails, even without roller furlers. Being gaff rigged there is minimal heel. It has a self tacking jib, so very little intervention is required once underway. Minor tuning from the cockpit is all that is required, if I get the urge. Some may argue about the added cost of maintenance. I would say it would be much less maintenance time and cost compared to an auxiliary engine and a stabilizer system. I get increased fuel economy, speed, stability, and reliability for very little effort or cost. Being gaff rigged there is minimal heel. A low rig , not just a gaff gives minimal heel. A modern MS would never bother with a gaff , full battens of pulltruded GRP made gaffs obsolete 40 years ago. Many MS will have a large enough deck house that only sleeping and the head is below , most waking activities are carried on with light and air. Sadly this can only be done with a generous sized vessel, 50-60+ ,and still look good..
FF - A gaff rig almost always has a lower center of force in comparison to a Bermuda rig, given the same sail area, hence less heeling. The only negative with gaffs is decreased ability to point windward. Its not much of a worry with a motor sailer though. The extra stability with the sails is often not required pointing directly into the wind. Or just point off 25-30 degrees and make use of the extra speed. Gaff rigs are regaining popularity with cruising boats. They fell out of fashion for many years as they do not race well, as most rules & courses are weighted to favour windward performers. My layout has only the sleeping & head below in a 30 footer. Some may not like the looks; but I'm smitten with it. I would agree with the points made about motorsailers. I appreciate having the back up propulsion and a way of steadying the boat while underway. I also have fuel efficiency and greater range than most regular sailboats. I have a range of around 1200 nm at 6 knots more if i was doing a lot of sailing or motorsailing. I find i have at least some sail out most of the time to assist with role or to improve fuel economy and to reduce engine noise by allowing reduced rpm. I think the greatest perk for my cruising area (PNW) is the ability to steer from a nice warm protected cabin. The pilothouse on my boat allows me to boat with two young daughters ages 2 and 4. I don't think i would take the girls out in my last "traditional" sloop. Some argue the motorsailer is the worst of both worlds as it neither powers nor sails well. I tend to think of it as the best of both worlds. Some argue the motorsailer is the worst of both worlds as it neither powers nor sails well. I tend to think of it as the best of both worlds. Interesting comment as I've often thought of the MS being the "best" of both worlds. If I was a serious cruiser and not just a coastal cruiser, I'd sure consider one. As a true sailor who not want to live in the cave anymore its for me the only option to keep on cruising long distance. If you like to entertain on the dock, little fishing some ICW and Bahamas, go for a Trawler. 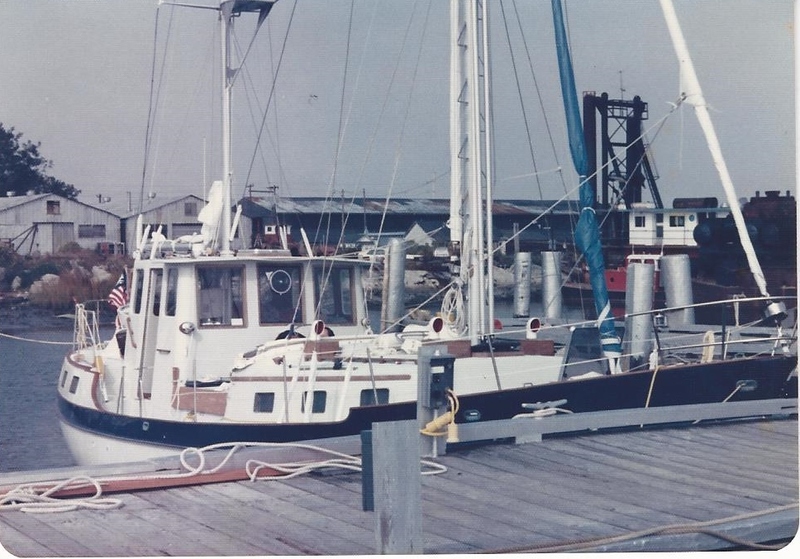 I saw an interview with a Nordhavn 56 owner who had traveled along the west coast and down into the Sea of Cortez (sp?). He claimed that using sails and the lugger engine with the adjustable pitch prop he could maximize efficiency at 8 knots by running the engine at 1050 RPM and about 70% loading to get an estimated 22 hp he needed to go from 5 or 6 knots to 8. Here's the kicker, set up this way his 45 ton boat was burning 1 GPH. I love that strange looking boat. I have no experience but I read an awful lot. To me, that boat is a jewel. It does lack deck space for hanging out and there's the heel under sail to deal with. It has a sailing cockpit amidships , a rear cockpit and whatever room there is on the foredeck between all the hatches and other sailing fooforaw. My plan for a couple of years has been to add a mast and huge short cut furling genny for our boat. Like the boys down under it's nuts not to make the wind your friend if you do a lot of open water cruising. Frankly I have always considered it to be the greatest thing you can do to a trawler. Imagine "bad" weather being a good thing?!! It is the ultimate game changer. My plan for a couple of years has been to add a mast and huge short cut furling genny for our boat. Sailboats are designed with keels which balance the heeling effect sails can produce. Auscan`s boat, and MS boats designed as such, should be fine, but you should consider the self righting moment or ability of a given powerboat before adding mast and sails; also the location, mast stepping, ie on deck or thru deck to keel, and the considerable downwards and side forces mast and rigging can exert. Particularly if the boat was not originally designed to carry a mast. Even if the idea is for just a genny or MPS for running with the wind behind or on the quarter, wind velocity and/or direction can change, changing the forces on the boat. Perhaps THD will come in on this interesting discussion. You're right Bruce, considerable thought needs to be put into it before adding a mast and sails. I don't have an overly deep keel (3ft 2" draft) but I have lead ballast which the non-sail versions of this boat don't have. Also the sail area (600 ft2) is about 50% less than a traditional sailboat of this size. As mentioned earlier, my sail design has a low center of force which adds to minimizing heeling and the chance of a rollover. Still - on some trawlers a retrofit could be done safely with some research and guidance, although the effort and expense may be hard to justify. Daddyo - You may have to lose your lovely flybridge to get the sail area closer to the water, but I can understand your yearn for a steadying sail in the waters you travel. I'm trying to picture it; maybe HH can help. mast I envision would allow for no more heel then she often "enjoys" in some conditions. In fact the idea is less heel "roll" not more. Yeah, the Defever's do have a low COG, and a long foredeck. This may give you enough room for a steadying sail. It would certainly be worth speaking to a good designer about it. From a novice like myself's point of view, I would be a bit concerned about the overall balance with sail area only on the foredeck. Would it force the bow down? Does it need to be balanced with a mizzen? I dunno. It's worth investigating though. Have a look there, it might give you some ideas. I can't picture it either. 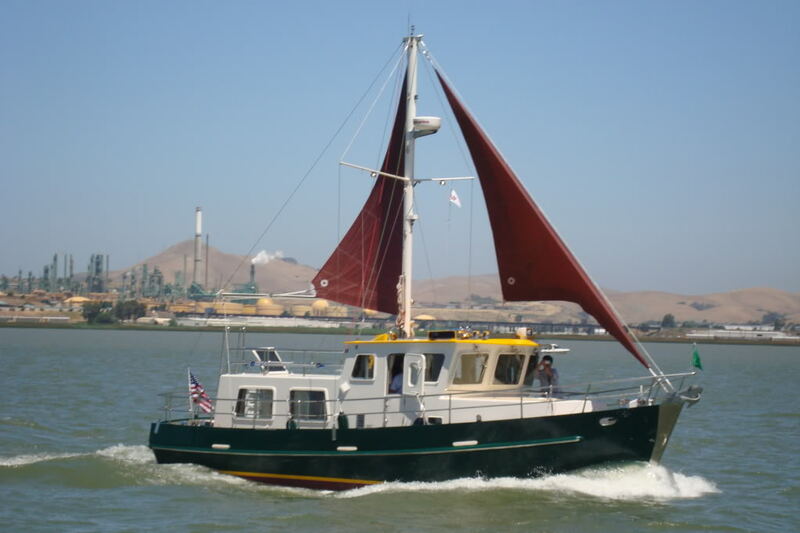 Fortunately, I found this almost identical 48' Motor Sailor conversion in the archives. Beautiful boat, that one. I especially like the hydraulic powered boom that doesn't require mainsail sheets. Thanks healhustler, archival research can be so rewarding. Those sails would certainly lighten the load of "the Lehman Brothers". It`s Daddyo`s expression, as another proud owner of the twins I gratefully adopted it, as well as the twins. A boomless mainsail could be an option.